India probably has the highest volume of SMS exchange through-out the world, except maybe China – Millions of SMSes are sent and received on daily basis, yet till today mobile subscribers do not have facility to send and receive smses in local language. Given the English literacy levels in India, I would assume that only about 1 in 5 mobile user is able to send and receive smses currently. 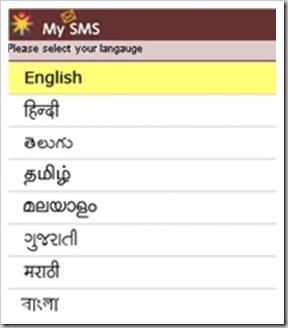 Now, potentially this may change – IMImobile, a Hyderabad-based VAS infrastructure and services enabler for mobile operators, has announced a new service “My SMS” that will enable SMS in 8 different Indian languages – English, Hindi, Telugu, Tamil, Malayalam, Gujarati, Marathi and Bangla. These 8 languages should potentially open doors to over 80% of 850+ Million strong mobile subscriber base in India. What is My SMS service? My SMS is essentially a SMS-based application which allows users to request SMS services in their native language and get messages in requested language on demand. Being on SMS only, this application is completely handset agnostic. Any mobile user with any handset will be able to use My SMS services! A user has to simply activate the services through their mobile service provider. IMImobile plans to offer this service as white label solution to various telecom providers, so it will not be exclusive to any one single provider but all of them! If this app becomes popular – It would mean literally mean doubling or tripling the SMS volumes of today. It would also bring masses much closer to telecom revolution! Let us wait and see how effective “My SMS” is in real world! Mobile Subscribers numbers in India fall again, now at 908 mln!